The Deere 210 Series Skip Loader is one of the most popular in the industry due to power, comfort and unsurpassable performance in the field. Deere 210 has evolved enormously from the early 210C to the 210K we have today. The new 210K offers more horsepower, lifting power, and pulling power, none of that means anything without a good set of tires underneath you. 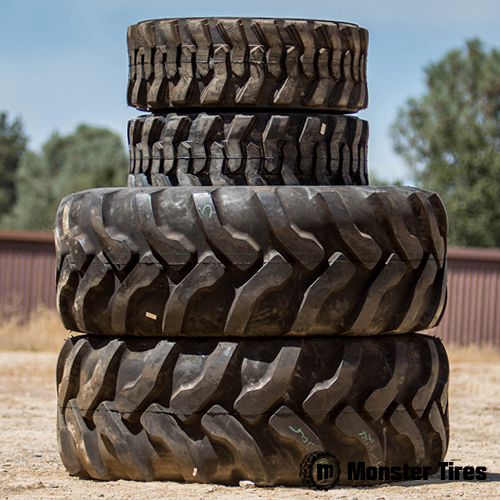 When it comes time to replace your Deere Skip Loader Tires look no further than Monster Tires. Monster Tires offers the largest selection and lowest prices on Deere Skip Loader Tires. Fully Staffed 9-5 Office of Construction Equipment Tire Experts! Your John Deere Skip Loader needs good tires to be able to run. The safety of your work site and your crew depends on your equipment being sturdy and reliable. When you are looking to replace your John Deere Skip Loader Tires, our full staff of construction equipment tire experts can answer all your questions and make sure you have the information you need to choose the right tires. We stock 260 – 280 Skid Steer Tires, 328 – 332 Skid Steer Tires, and 210C – 210LJ Skip Loader Tires. Affordable Construction Tire Resource. Whether you are looking for a Tire Package for John Deere Skip Loader, a Front Tire Set for John Deere Skip Loader, a Rear Tire Set for John Deere Skip Loader, or a Set of 4 Tires for John Deere Skip Loader, we have the tires you need here at Monster Tires! We specialize in Heavy Equipment Tires to get your piece of equipment rolling again, as well as High Quality OTR Tires for construction companies and home owners. Trust in Monster Tires for your next set of John Deere Skip Loader tires!